WACO, Texas – The Bears outlasted Texas Southern in an 11-inning affair Tuesday night, recording their third walk-off win of the season after coming from behind to defeat the Tigers 3-2 at Baylor Ballpark. Ryan Bertelsman provided the dramatics, driving in the game-winning run in the bottom of the 11th, his second walk-off hit of the season. The Bears used a combination of five pitchers to hold the Tigers (6-18) to just two runs on five hits. Offensively, Nick Loftin and Davis Wendzel went a combined 6-for-8 to lead the way. Tyler Thomas got the start for the Bears, but was chased after just one inning of work. Blake Helton, the first man out of the bullpen, matched his career high with four innings pitched and also recorded a career-high three strikeouts. The Bears (18-6) opened the scoring in the bottom of the fourth with a two-out RBI from Cole Haring that scored Shea Langeliers. Then, it was back to work for Helton as he retired the side in order in the fifth. Helton began the sixth on the mound, but was pulled after allowing back-to-back hits to start the inning. Jacob Ashkinos came on in relief, but not before the Tigers scored two runs on two hits and one error to take a 2-1 lead. Ashkinos came back to strike out the side in the seventh and the Bears knotted the score at 2-2 in the bottom half as Loftin singled home Haring. The score remained tied as Luke Boyd and Kyle Hill put up four innings of zeros for the Bears. They combined to allow just one hit and recorded a pair of punchouts. Baylor left the bases loaded in the 10th, their best scoring chance until the bottom of the 11th, when Loftin singled, Wendzel was intentionally walked and Bertelsman came through with the game-winning knock. Kyle Hill (4-0) earned his team-leading fourth win of the season while Tigers’ reliever Chris Suarez (0-2) was hit with the loss. *This was Baylor’s third walk-off win of the season. *The 11-inning game was the longest Baylor has played this season. *Baylor has won five games in a row and nine of its last 11. This is the second time this season the Bears have recorded a win streak of at least five games; the Bears opened the season with eight consecutive victories. *The Bears have scored 44 runs during their five-game win streak. *This was Baylor’s 11th come-from-behind victory this season and third in as many games. *The Bears are now 12-0 against Texas Southern all-time. *Baylor is 4-1 in midweek games this season and 31-11 in midweek contests under head coach Steve Rodriguez with a 22-9 mark at home. *Since inserting Nick Loftin in the leadoff spot on March 10, the Bears have scored 83 runs on 127 hits in their last 11 games. Loftin is 18-for-43 with 3 HR, 10 RBI and 14 runs scored during the stretch. The Bears are 9-2 in such games. *Loftin stole his sixth base of the season and Shea Langeliers nabbed his second, moving the Bears total to 28 stolen bags on 37 attempts. Baylor was 34-for-51 when trying to steal in 2018. *Cole Haring’s two-out RBI in the fourth inning and Ryan Bertelsman’s two-out RBI in the 11th was Baylor’s 91st and 92nd runs scored with two outs this season. Over half of Baylor’s 182 total runs have been scored with two outs. *Blake Helton matched a career high with four innings pitched and recorded a career-high three strikeouts. *Loftin has a team-leading 11-game on-base streak and seven-game hit streak. He picked up his team-leading 16th multi-hit game of the year. *Loftin has tallied five straight multi-hit performances. He is 11-for-18 over those contests. *Andy Thomas extended his on-base streak to 11 games with his third multi-hit game of the season. *Haring extended his seven-game on-base streak with his seventh multi-hit game of 2019. *Langeliers has a seven-game on-base streak. *Josh Bissonette has a seven-game on-base streak and a five-game hitting streak. *Bertelsman extended his six-game on-base streak with his second multi-hit game of the season. *Davis Wendzel extended his five-game on-base streak with his 11th multi-hit game of the year. 15 – The Bears tallied 15 hits on the night, all singles. Baylor has recorded an extra-base hit in 22 of 24 games this season. 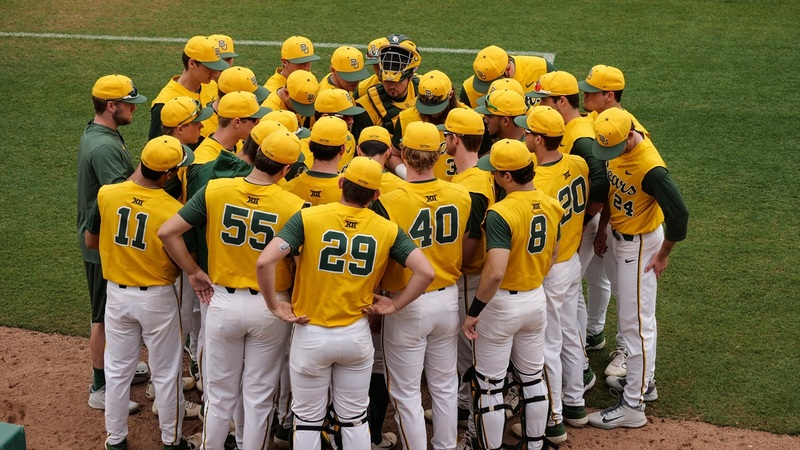 The Bears will hit the road for their first Big 12 conference series away from Baylor Ballpark as they take on the Kansas Jayhawks in a three-game series in Lawrence, Kan. with game one scheduled for Friday, March 30 at 6 p.m. CT.